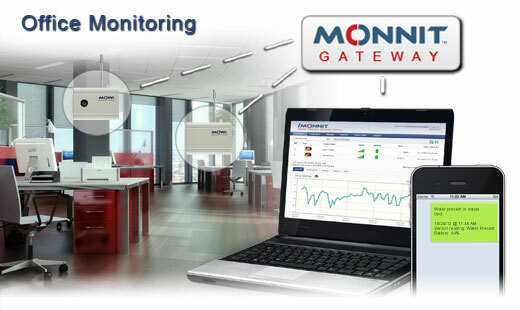 Wi-Fi Monitoring Solutions for Office Buildings | Monnit Corp. Managing office and commercial buildings efficiently, yet cost effectively is challenging. Whether it's a large or small office Monnit has a reliable, wireless, remote monitoring solution that can easily work with your companies existing Wi-Fi networks. Monitor Multiple Aspects of Your Business with one System. Monnit provides a variety of different wireless sensors perfect for your business; door/window, motion detection, water detection, temperature and light sensors are just a few. Monnit Wi-Fi sensors, can use your existing Wi-Fi networks to connect to the online portal. No other hardware is required. Monitor your sensors anytime, from anywhere with the iMonnit online sensor system. Receive real time alerts via SMS text, email or voice if any sensor detects a reading outside of an optimal range. Door/window sensors and motion sensors can be used to monitor for unauthorized access. Water sensors can detect plumbing leaks around water heaters, faucets and toilets. Temperature sensors can track HVAC systems for efficient operation, helping you lower operating costs associated with heating and cooling. iMonnit Premiere Online Monitoring - Advanced features for a minimal annual fee. Who's Using Monnit Wireless Sensors? ©2009-2015 Monnit Corp. All Rights Reserved.